ROSCOE VILLAGE — A crowd that filled a local church Tuesday night to hear about the planned development of the Lathrop Homes wasn't soothed by further promises of new amenities, a downsized density and new traffic plans. More than 300 people showed up at New Life Community Church to hear the Lathrop Community Partners latest plan to develop the public housing complex. Both activists and current Lathrop residents donned black shirts to protest the decline of public housing units from 925 to 400 in the new plan. 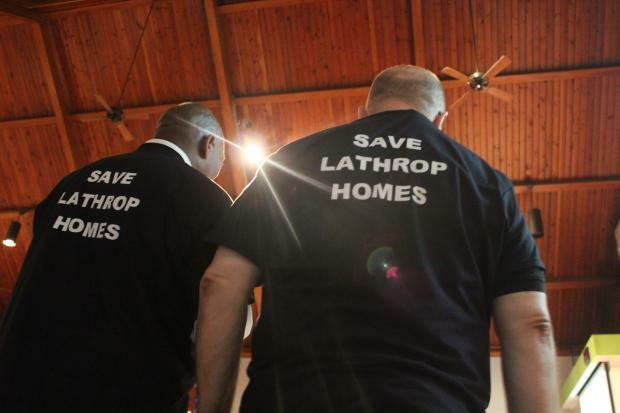 The shirts declared "No Market Rate" on the front and "Save Lathrop Homes" on the back in a bold white font. "It doesn't make any sense," said Javier Berrios, 51, who's lived in Lathrop since age 6. "Why don't you have more space for people to live?" But of all the aspects of Lathrop the partners and Chicago Housing Authority are willing to change, the ratio of market rate housing to public housing is not one of them. The partners filled two rooms with blown-up posters of the plan, white models of buildings and refreshments in hopes of getting feedback on what amenities residents and neighbors want, from types of retail to transportation options. But keeping the planned 1,116-unit complex mixed — with 36 percent public, 19 percent affordable, 45 percent for "unrestricted incomes" — is "critical to be sustainable," said Michael Jasso, CHA's chief development officer. "This is a framework we think is sustainable in terms of master plan but also transforms and truly rebrands the site," Jasso said. Although Berrios wore a black protest shirt, he felt there's nothing he could do about returning his childhood home to its glory days of public housing. Many former neighbors left over the years. The new plan, which touted four public spaces for concerts or farmers markets, sounded like it could improve the area, Berrios said, and with little other power to bring back old friends, he just wants a good construction job. "I don't like it, but there's nothing I can do," he said. The plight of people seeking public housing was not lost on Roscoe Village residents. Ellen Pachter, 55, said she was happy to hear that the tallest building in the complex will be moved south of Diversey and the new plan will probably raise her property values. But she felt "devastated" for the people who were losing public housing. She and her husband, Charles, never had problems with Lathrop over the years, and she'd like to hear more details on where the families will go. "It's the model of what good public housing is," she said of Lathrop when it was filled. "My heart bleeds for the people who had to leave." And for other issues that directly affect residents, like traffic and parking — it's "bulls---," said Deborah Bayly, who's lived in Roscoe Village for 32 years. Doug Farr, with Lathrop Community Partners, presented a plan that added seven crosswalks to the area, two new streets near the notoriously congested Clybourn/Damen/Diversey intersection and a traffic signals at Schubert. New Lathrop would offer 752 parking spaces and the streets would offer 259 more, Farr said. Retail and building uses, including some places that would act as work-and-live spaces for some families, would keep in mind reducing car usage, Farr said. But Bayly said people who live in market rate housing want to have two or three cars, and even low-income people can afford to drive, now. The traffic and parking will do little, she said. "It's not factoring in that it's a new era," Bayly said. The partners hope to finish the planned development this fall and start the first phase of construction in 2015. First units of development, which will finish in phases, should be ready in 2016. Despite their emphasis on community involvement, several people said they already felt the plan was a done deal. Any new comments feel worthless, they said. "This is lip service," said Charles Pachter, 65. "They don't give a rat's a--."